If you're a fan of Minecraft, then you've probably heard that Cube World is set to be the next big indie game. The Beta is almost ready to download whilst Wollay adds those final touches. Just like Notch did back in 2010, Wollay is creating Cube World entirely on his own. He recently rejected a part time job with Mojang so he could concentrate his efforts on his own game. He also states on his blog that he doesn't want any help either! Although Cube World has been compared to Minecraft it's actually similar to the old Zelda games of the past. If you don't know what Zelda was then you're probably too young. Check out the Wikipedia page and you'll start to see why the game was so huge. Wollay informs us that the Beta version of the game will be ready in the next couple of months (probably April/May time) although precise release dates are not known. If you do see a Beta version of the game available for download now, it's probably fake and will almost certainly contain nasty viruses and the like. We recommend staying clear of these until the official release. Don't worry, we'll let you know when that day comes. The Beta version will ONLY run on Windows PC's and NOT Macs. Wollay has said that he will write a Mac compatible version later. You'll need a video card to render the 3D models and animations but if you already play Minecraft then you should be ok. The Beta version will also come with a multiplayer option. Wollay is still testing the Cube World servers for performance but we expect that you'll be able to create your own servers using something like Bukkit. So whilst you wait for the next big indie game, feast your eyes on some of the latest Cube World videos below..
Get a glimpse of the superb fighting animations and possibilities. Taken straight from the Zelda handbook, they look fun! This video shows off some of Wollay's latest work. It's the spirit system that lets you deal more damage to enemies and also heal yourself. You get the spirits by upgrading your weapons. What features does Cube World have? 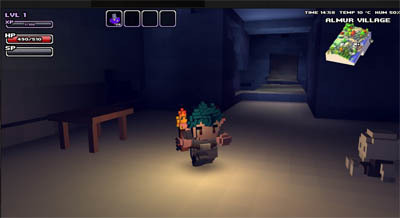 There are lots of features in Cube World but here are just a few..
Quests – building, killing, discovering.. Weapons – dual wielding, bows, swords, axes, armor, upgrades..
Open landscapes – jungles, deserts, snow regions, farm land, waterfalls, villages..
Mobs - pets, crabs, gargoyles, crows, dwarves, hornets, lizardmen, trolls..